HWC has coordinated ten women artist communities & lead artists across Bougainville with QAGOMA, the Queensland Art Gallery of Modern Art: Asia Pacific Triennial (APT9) for a project known as ‘WOMEN’S WEALTH’ exhibition. ​See below for a blog post from the QAGOMA's Pacific curator, Ruth McDougall, describing the project. Women’s Wealth was inspired by a shared dream to create opportunities for Bougainville women to engage in new creative conversations. A collaborative effort between the Gallery and three Buka women — cocurator Sana Balai, and artists Taloi and Marilyn Havini — the project was initiated via a research trip with Sana across Bougainville in April 2017. We were welcomed by the Hakö Women’s Collective, under the mentorship of Marilyn Havini in Sana’s village of Lontis on Buka Island. With guidance from the extended Havini family, Sana and I travelled south by road through stunningly beautiful landscapes, meeting people still struggling to rebuild their lives after the trauma of the 1990s war.3 By attending markets, visiting remote villages, talking to community leaders and spending time with women as they worked, we identified and gained the trust of a group of ten artists working across art forms. A month later we headed to Choiseul in the Solomon Islands and, with the assistance of the Choiseul Province Council of Women and contacts in Honiara, invited an additional four Solomon women to participate in the project. The result was a ten-day creative workshop in September 2017 involving an intergenerational group of 19 artists from across AROB, the Solomon Islands and Australia. 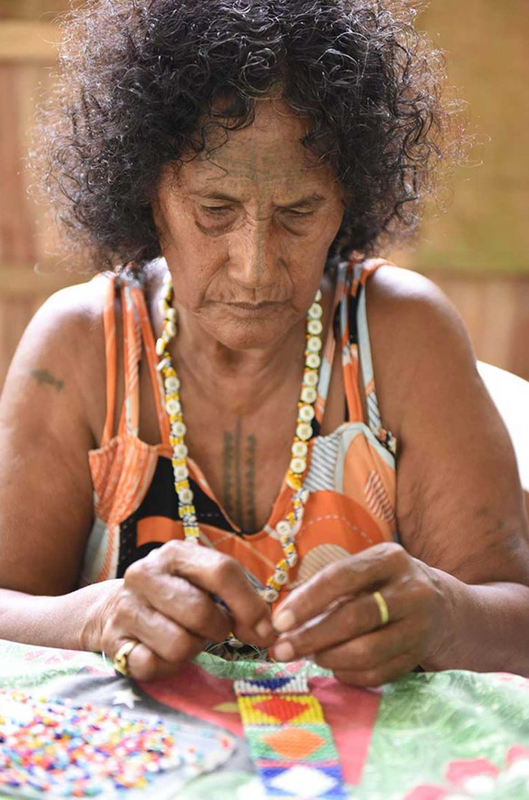 The workshop was supported by the Australian Government through the Australian Cultural Diplomacy Grants Program of the Department of Foreign Affairs and Trade, and QAGOMA’s Oceania Women’s Fund. Held at the Nazareth Rehabilitation Centre, Chabai, on Bougainville Island, the workshop provided a physically and culturally safe space for the exchange of ideas, techniques, knowledge and skills. Through dialogues with Indigenous colleagues, the women explored the ways in which creative work can act as a platform to articulate individual and collective stories, histories and aspirations.4 These conversations, and the process of working and living together, built confidence and resulted in strong friendships, generating much excitement around the opportunity to present the women’s work on the APT9 stage. 1 Bougainville, the Shortland Islands, and the islands of Choiseul, Isabel and Ontong Java were proclaimed part of German New Guinea in 1886. Britain claimed the remainder of the Solomon Archipelago as a Protectorate in 1893. When another convention shifted the German/British border north in 1899, the Shortland Islands and Choiseul became part of the British Solomon Islands. Australia seized control of the North Solomons (Bougainville) in 1914, and after a concerted effort in the early 1970s towards self-determination, Bougainville became part of an independent Papua New Guinea in 1975. 2 Although a predominantly matrilineal culture, a small area around Buin in South Bougainville and some communities in Central Bougainville are patrilineal. 3 The Bougainville conflict erupted in Central Bougainville in 1988 over environmental concerns and the distribution of royalties associated with the highly profitable Panguna copper and gold mine, owned by Conzinc Rio Tinto. Thousands of civilians were caught in the conflict between the Bougainville Revolutionary Army (BRA) and the PNG Defence Force. The accompanying decade-long blockade resulted in more than 15 000 deaths, an almost total destruction of infrastructure, and a disruption to formal education affecting whole generations. A peace agreement was signed in 2001. 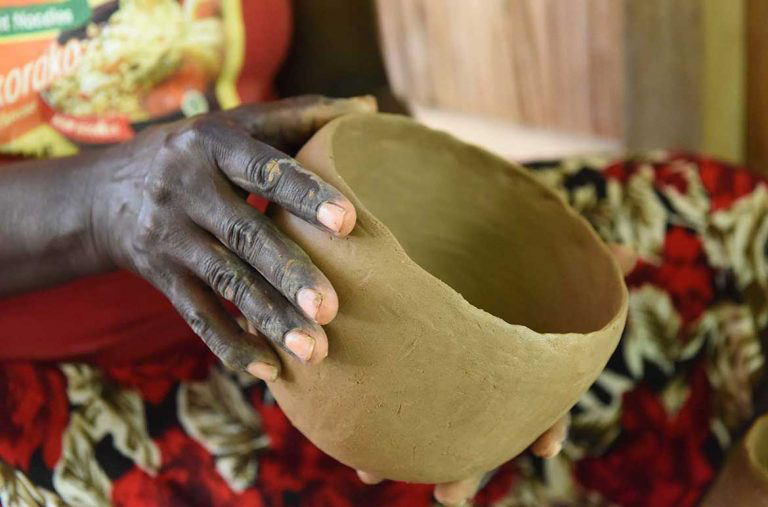 4 In addition to First Nation women from Bougainville and the Solomon Islands, the Australian group included Aboriginal artist Elisa Carmichael, Torres Strait ceramicist Janet Fieldhouse and Bougainville/Australian artist Taloi Havini. blog.qagoma.qld.gov.au/countdown-to-apt9-pacific-nations/Ruth McDougall is Curator, Pacific Art, QAGOMA.